what an incredibly sweet picture! Hi Hilary, I have sent you 2 emails about a pattern I bought, I am wondering if you received my email? Thanks. Sweet. Our neighborhood kids just got together and had a giant leaf fight last weekend, it was adorable! I just did this myself on a walk yesterday. Felt like a little kid! I can hear the leaves! 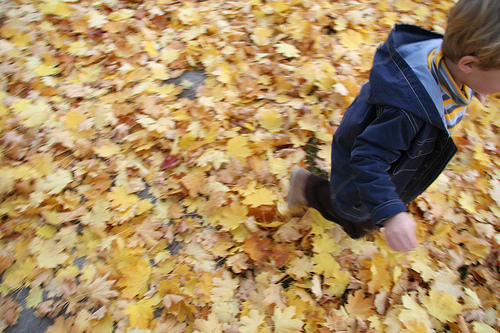 There’s nothing quite like the crunching of leaves under ones feet!